This guide is for the 1985 Capcom game. 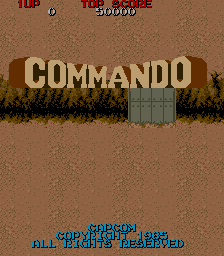 For the older 1983 Sega game, see Commando (1983). Commando was originally released in Japan as Senjou no Ookami (translated as "Wolf of the battlefield"). It is a vertically scrolling shoot'em up arcade game developed by Capcom, and released in 1985. Its influence can be seen in several later games in the genre such as Ikari Warriors. It was released for several platforms, including the Commodore 64, Amstrad CPC, MSX, ZX Spectrum, Intellivision, Atari 2600, Atari 7800, Commodore Amiga, NES, Acorn Electron, BBC Micro and PC. Versions of the game also appear on Capcom Classics Collection for the PlayStation 2, Xbox, and PSP, and Activision Anthology for the PlayStation 2. All versions of the game are very similar, with the same graphics (taking into account the various limitations of the platforms). The player (Super Joe) starts by being dropped off in a jungle by a helicopter, and has to fight his way out singlehandedly, fending off a massive assault of enemy soldiers wearing German WWII-era uniforms. The hero Super Joe is also the main character of the early games in the Bionic Commando series: The Speed Rumbler and the first Bionic Commando. Then, starting from the second Bionic Commando (NES), Super Joe becomes the man to be rescued. 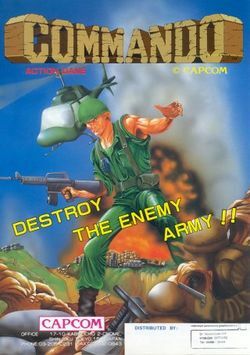 The gameplay of Commando becomes fully integrated in the second Bionic Commando (NES). In particular, it becomes the encounters with enemy trucks. Commando (originally "Wolf of the Battlefield") spawned two direct sequels: Mercs (originally "Wolf of the Battlefield 2") and Wolf of the Battlefield: Commando 3. This page was last edited on 11 June 2017, at 20:20.